What are the Best Flowers to send a Patient in Hospital? Hospital flowers - We find the most suitable are bouquets made in voxes - your beautiful bouquet packaged in a water-filled box for long lasting freshness. Alternatively a more compact floral arrangement in oasis, or one of our lovely seasonal posies, are popular flowers to deliver to the hospital. This makes it super easy for the patients, and nurses as the flowes are self contained and they don't need to find a vase. Bright, colourful, happy flowers work wonders! FREE Delivery to all Auckland Hospitals. Balloons, Plants and healthy gift baskets are another option to let the patient know you are thinking of them, and wishing them a speedy recovery. Can you deliver Gifts to Starship Hospital? 6 Days a Week Flower Delivery service to Auckland Hospital Grafton, Starship Hospital, National Womens Hospital Grafton, NorthShore Hospital Takapuna, Waitakere Hospital Henderson, Middlemore Hospital Otahuhu, Ascot Hospital Remuera, Mercy Hospital Epsom, Brightside Hospital Epsom, Southern Cross Hospital Epsom, Southern Cross Hospital North Shore. 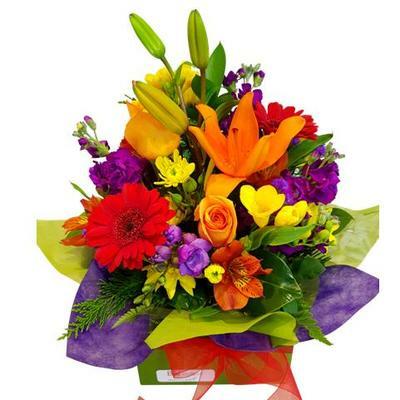 We also deliver flowers and gifts to all rest homes and other private hospitals in Auckland. Buy flowers securely online.